Down South, they call the college game Big Boy Football. Call Ray Glier a Big Boy Journalist. Glier bylines pepper the New York Times and USA Today sports pages like forward passes in October. He covers mostly baseball and football, an old pro at the game of wringing quotes from unquotable athletes and coaches, then spinning good stories. Last spring, the Atlanta-based writer got the attention of a publisher with a pitch for his first book—why, exactly, has the Southeastern Conference, or SEC, won the past six national championships in college football? “The national championship trophy has been in the South so long it has a sunburn,” Glier writes in his savvy, newly published study of SEC dominance since the 2006 season, a streak that includes titles won by The University of Florida (twice), Louisiana State University, Auburn University and The University of Alabama (twice). So what makes the conference a Goliath? Glier sweated out his answers during a 56-day journalist’s version of, say, Bear Bryant’s infamous Junction Boys training camp. (In 1954, Bryant put players at Texas A&M, today a new school of the SEC, through 10 days of hellish all-day drills in 100-degree temperatures, likely the most brutal team-building event in college sports history.) In eight weeks, he churned out this timely, entertaining analysis of the rise of the Southeastern Conference, its key figures (including a primary one, current University of Alabama head coach Nick Saban), and lots of its dirt. It turns out that the secret sauce down South boils down to one fact of Newtonian physics: Big and fast beats just big. Big and fast beats just fast. Big and fast can only be beaten by bigger and faster. The South, for whatever reason produces big, fast players … especially those that man the defense. SEC players arrive with attitude. Some burn to rise out of poverty. Some want to prove something that didn’t get proven during The Civil War. Some simply bear gifts of fleetness and pluck and ferocity and, yes, size/speed that set them apart as athletes. Most choose to play close to home, close to mama and girlfriends and tradition. The martial spirit of the region keeps the value and values of football front and center every day of every month of every year—the obsession simply doesn’t exist at such volume in any other part of the country. All this goes into the calculus of SEC dominance. Glier’s most interesting pages reveal how the hand of Saban has shaped teams and, consequently, the conference and, inevitably, the game itself. Saban coached at Louisiana State University prior to Alabama, where he rejiggered the DNA of that university’s football program to produce a national champion before he went off to new worlds to conquer with the National Football League’s Miami Dolphins. Conquered himself by the NFL professional, immune to the micromanagement essential to Saban’s process, the coach returned to a fat contract at Alabama, where he broke out the DNA makeover machine again and went to work reenergizing that storied program. Alabama has since won two national championships under Saban, and the Crimson Tide appears among the select teams contending for the BCS title this season. What makes Saban successful? That’s Glier’s secret sauce in this book. He includes chapters on Saban’s pitch technique to recruits, how he impresses mom and dad and athlete by stressing the “40-year decision” the choice of college and athletic program represents. Even more delicious are Glier’s chapters on how Saban and his assistant coaches assess recruits using a complicated, unforgiving rating system that little resembles the popular one- to five-star rating systems of recruiting publications. Glier gives inside football at the most deliciously detailed level. The business of SEC football can’t be overlooked, of course. Many millions of dollars pass hands and pass through programs in the richest of college football conferences. All that money affects the game, makes the grass greener some places than others. Glier keeps his balance here, pointing out the good and bad SEC money brings. Spy-novel intrigues saturate this book, the tales of alums and boosters waving checks in the air, schools jealously reporting (or suggesting) violations at other schools, recruiters nibbling at the edges of the rule book to bring in some—here we go again—big and fast young man with the potential to elevate a program. Glier’s best spadework comes in a provocative series of emails from members of the athletic department at the University of Tennessee directed to athletic director Mike Hamilton. The missives beg Hamilton to clip the wings of then-coach Lane Kiffin (now head coach at Southern Cal, after a hasty SEC departure) as he appeared to flout traditions and rules in efforts to recruit high-school stars. Glier suggests Kiffin left before he could be outed by former players fed up with the young coach’s cheek and his possible indifference to NCAA rules. “Everybody knows that football coaches at some schools can take students who would not normally qualify academically in through the back door of the admissions office. The “special admits” help schools generate revenue. Just think about the top thirty to thirty-five football players on an SEC roster. These kids, the really talented players, are generating millions of dollars for schools, which funds other sports on campus, with the exception of basketball at some schools. If you take away some of these thirty to thirty-five players, the football program may not click and win games and make money and pay for many things in the athletic department. Some of those thirty to thirty-five stars are special admits. “Let me repeat that. Thirty students on campus – the stars – prop up the whole enterprise. Take away enough of those athletes and the enterprise collapses. So what do you do with the few special admits? Do you really shut the doors to them and deny them access to major institutions? That is incomprehensible for two reasons. One, some of these students come from some of the worst public school systems in America. Why not give them access to tutors and teach some solid skills? 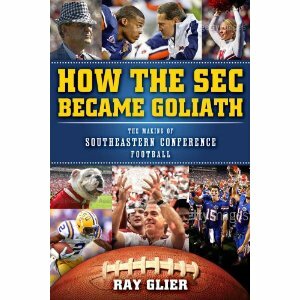 For readers who happen to be SEC fans, Glier gives satisfying copy to most every school (His speculation on the rise of The University of Georgia appears this year to prove clairvoyance.) For non-SEC fans, the book may not be the same page-flipping, one-sit read, but for a playbook on how football works—the game and the business—you’ll be hard-pressed to find better. Read it now. Other conferences may steal the crown from the SEC, maybe as soon as this season. Until then, Saban is Real, to cruelly paraphrase The Louvin Brothers. Charles McNair is Books Editor of Paste and author of the novel Land O’ Goshen.